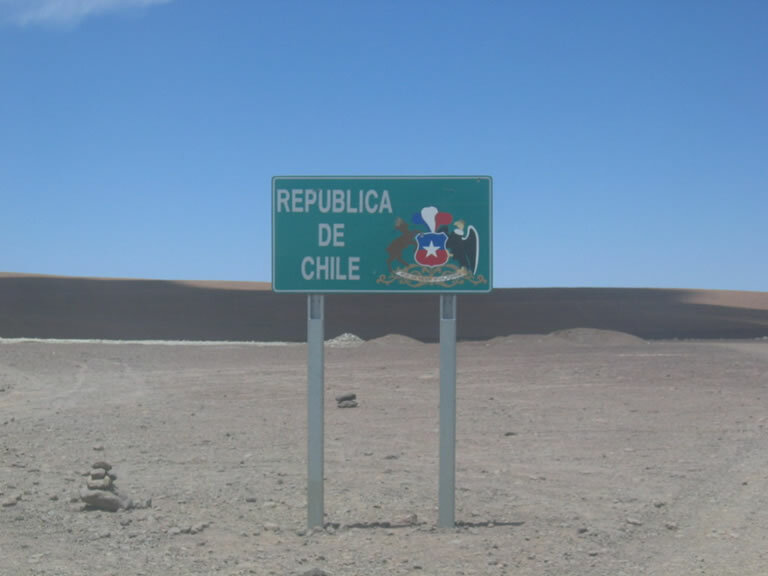 The border crossing into Chile was again a very painless country change. Having exited Bolivia we had a bit of a drive to San Pedro de Atacama where the Chilean formalities would be carried out. No sooner did we enter Chile than the road became fantastically paved - if somewhat steep in descent - and the sun came out. A welcome relief after four days of cold, off and on wet weather and rough dirt tracks. Unfortunately by the time we reached San Pedro, most of the officials were at lunch so we had to sit and wait in the hot sun before we could officially enter Chile. Whilst we waited for the immigration and customs officials to return we completed formalities with SAG, the agricultural ministry. To enter Chile you are not allowed to bring in any meat, products of vegetable or animal origin or fruit, and you have to sign a form to say you have none of these products. They can do extensive searches, but the guy at the SAG office took a cursory glance in the back and front of the Weasel and left it at that. (A bus full of backpackers arriving just after we were inspected had a different experience - they all had to get their bags off the bus, go into a building and have their luggage thoroughly searched.). They did however spray the Weasel's tyres with disinfectant and asked us to stand on a mat soaked in disinfectant, due to apparent Foot and Mouth outbreaks in Bolivia. With the agricultural formalities completed, we moved on to Immigration. This took just a couple of minutes as the official entered our details into his laptop, whilst customs took a bit longer, mainly due to all the form filling. A"titulo de importacion temporal de vehiculos" was typed out and Ed's passport was stamped with "entrada con vehiculo", which meant he couldn't leave the country without the Weasel. The lady in customs was really friendly and spent most of the time singing along to the radio as she completed the various forms and entered our details on the computer. She then came out to have a quick look at the Weasel and we were through, on our way to San Pedro centre. We found a campsite on the edge of town - Camping Los Perales - and having pitched the tent we enjoyed the luxury of a hot shower - the first in four days! It had to be a quick shower though as there were signs everywhere asking people to be economical with water - a reminder that we were in the desert. San Pedro was a useful stopping off point but could easily be renamed "Gringo town" as it was full of tourists, probably outnumbering the locals. We wandered into town and sat in the central plaza for a much needed beer and people watched for a while. It already felt a world apart from Bolivia, Peru and Ecuador - a lot more affluent and developed with a western feel. We picked up some steaks and veg when the shops eventually reopened around 5pm and headed back to the campsite to cook outside and enjoy the hot, dry weather.